Adverse drug reactions (ADRs) are the fourth leading cause of death worldwide. In the U.S. alone, 2.2 million serious ADRs are reported annually in the hospitalized population, with over 100,000 deaths. Models that better predict a drug’s efficacy and a drug’s toxicity cost-effectively are the need of the hour. “A major challenge of drug safety testing is that preclinical studies with laboratory animals are not always predictive of human safety,” said Albert P. Li, Ph.D., president and CEO of In Vitro ADMET Laboratories. Dr. Li cited the frequent clinical trial failures due to safety concerns with drug candidates that have been chosen based on preclinical animal safety data. Dr. Li’s work suggests that “there may be species-specific differences in toxicity, resulting in discordance of results between laboratory results, animal, and human findings.” Liver metabolism differs greatly between other animal species and humans. For instance, as a drug is metabolized to a more toxic (metabolic activation) or less toxic (metabolic detoxification) compound, preclinical results with laboratory animals may not always translate into applications for humans. The involvement of metabolism in toxicity may also lead to individual differences in toxicity, which may explain the phenomenon of idiosyncratic toxicity, according to Dr. Li. Idiosyncratic drug toxicity is human-specific, occurring as a rare event (<1/5,000) and therefore, impossible to study in clinical trials or experimental animals. In fact, current trends suggest that regulatory agencies actively discourage animal testing in research. Europe has banned the use of animal testing for all cosmetics. Indeed, many drugs have been withdrawn from the market due to safety concerns. Instead, human cells are being used (e.g., induced pluripotent stem cells [iPS]) to yield cardiomyocytes or Parkinson’s neurons. As well, tissue engineering efforts have created three-dimensional tissue equivalents designed for transplantation into patients, and screened for toxicity. In vitro and in silico modeling of tissues and diseases using lab-on-a-chip technologies are available. As agencies such as the NIH, FDA, and the DARPA seek new ideas and proposals, researchers have come up with cutting-edge solutions. At the “International Conference on Predictive Human Toxicity and ADME/Tox Studies”, experts from the biotech and pharma industry discussed recent advances toward accurately predicting human toxicities and screening early in the drug discovery process. “We now have optimized the isolation, culturing, and cryopreservation of human hepatocytes to retain high viability and, most importantly, retention of drug metabolism capability similar to the human liver in vivo,” said Dr. Li. “These cryopreserved human hepatocytes now represent the gold standard for human drug metabolism research,” he added. Working closely with the FDA, Dr. Li and colleagues have developed an in vitro assay for the identification of drugs that cause liver failure. “Using the ratio of reactive oxygen species:cellular ATP content as the endpoint, we were able to identify drugs that are known to cause severe liver failure (drug induced liver injury, or DILI) with a specificity and sensitivity of near 90%,” he said. MCCA and CMPIA are designed to evaluate the key role of hepatic metabolism in drug toxicity. Indeed, hepatic toxicity is a major manifestation of drug toxicity since liver is exposed to a high bolus concentration of the drug after oral administration (first-pass effect). Also, the liver metabolizes a relatively nontoxic compound to form highly reactive and toxic metabolites, Dr. Li explained. “We have developed an additional assay with the IdMOC (Integrated Discrete Multiple Organ Co-culture) system with which we can detect toxicity to nonhepatic cell types by toxic metabolites formed by hepatocytes. Dr. Li proposes that the in vitro human hepatocyte assays be used early in drug discovery to eliminate compounds that have potential human toxicity. Further testing in classical toxicological assays of the compounds that are nontoxic to human cells in vitro can eliminate compounds with complicated toxicity profiles that may not be detectable with cells in vitro. The “combined human in vitro and animal in vivo” approach emphasizes the human-specific properties obtained in vitro, combined with in vivo parameters obtained with laboratory animals. It should provide data that are predictive of human toxicity in vivo, according to Dr. Li. Using metabolically competent cells such as HepaRG or primary human hepatocytes (A), ICCD can identify compounds that modulate bioenergetic balance (B) (here the rate of oxygen consumption is shown). The firm can also demonstrate accumulation of metabolites that interact with this modulation with increasing doses. In this example the metabolite produced limits the uncoupling properties of the parent compounds in a dose dependent manner from 0.5 to 5 µM. At 10 µM, the accumulation of the “detoxifying” metabolites is too slow to completely mask the uncoupling properties of the parent compound. This interpretation takes into account the other parameters measured in the same cells: ATP level, glycolytic involvement of the cells, and cell viability (not shown). “We can now put forward an insightful approach evaluating DILI using an integrated human in vitro-animal in vivo approach,” said David Kwok, Ph.D., CEO, BRI Biopharmaceutical Research. “You still need to have an in vivo animal model such as the one involving animal hepatocytes, given that safety assessment in animals is still a regulatory requirement,” he explained. “At BRI, we advocate the use of the high-content hepatocyte imaging assay in animal hepatocytes (rat, dog, and other relevant species) in support of in vitro/in vivo correlation and justification for a relevant animal species during subsequent IND-enabling preclinical safety evaluation,” said Dr. Kwok. Biopharmaceutical companies are looking to avoid false positives with their drugs. For instance, troglitazone may be safe in rat models, but 1 in 2,000 humans suffers from fatal liver injury. “This lack of liver toxicity in animal safety studies provided a false sense of safety.” It was withdrawn from the U.S. market in 2000. Most of these DILIs cannot be detected during Phase I and II clinical trials. It is essential to screen all the drugs for DILIs even if the incidence may be low, according to Dr. Kwok, citing valproic acid, which is on the market today as a life-saving anti-epileptic drug with a low incidence of severe DILI (1:1,000) in young children less than two years of age, or 1:50,000 in older children and in adults. “We do all the assays involving a variety of endpoints including cytosolic biomarkers such as glutathione, ATP levels, and reactive oxygen species in hepatocytes,” said Dr. Kwok. Mitochondrial bioenergetic balance may be a pertinent marker for early preclinical safety testing, especially in predicting DILI, according to Nathalie Compagnone, Ph.D., founder and CEO of Innovative Concepts in Drug Development (ICDD). Mitochondria are central to drug development as targets in CNS diseases, cancer, and metabolic diseases and as one of the main off-target sites causing undesirable side effects and toxicity. Dr. Compagnone’s team has developed a cell-based high-throughput screening (HTS) methodology to investigate the mechanisms underlying DILI and cardiac toxicity. The Mitosafe® technology developed at ICDD engages multiple integrated mitochondrial targets and the interactions are modeled. The functional bioassays reflect bioenergetic balance and redox status, and reveal mitochondrial DNA depletion, among other parameters. The Mitostream® technology engages multiple integrated cellular targets, with the interactions modeled via measurement of mitochondrial behavior. The technology measures the quantitative and qualitative levels of cellular adaptation, drug toxicity and sensitivity profiles, and disease signatures. “Mitosafe is for early deselection of hits using a mechanistic approach, and Mitostream is for anticipation of lead/candidate clinical tolerance,” said Dr. Compagnone. Dr. Compagnone and her team have developed a bioenergetic balanced screen (BBS) for fast, affordable, and efficient early toxicity testing by measuring the oxygen consumption rate, ATP levels, lactose production, and cell viability in live, nonpermeabilized cells. It identifies modulators of mitochondrial oxidative phosphorylation and glycolysis leading to ATP synthesis. It is used in identifying and validating a functional readout in HTS format that can be used as a marker to screen early compounds with potential toxicity, at dosages relevant to the clinical setting, she claimed. “Our bioassays tend to reduce the bias commonly used in measuring cytotoxicity by assessing pharmacological effects at clinically relevant doses leading to mitochondrial dysfunction, an early step of hepato- and cardiotoxicity,” said Dr. Compagnone. “If a drug produces unwanted modulation of mitochondrial dysfunction at a clinically relevant dose it can adversely affect the function of organs such as the liver, the brain, the heart, and the skin, which are sensitive to mitochondrial functioning for energy production.” Using clinically relevant doses also allows comparison of toxicity and efficacy on the same scale leading to a better definition of the safety window, defined by the range of circulating and bioactive doses. Gene expression profiling of large numbers of samples and intermediate numbers of target genes (about 30) may be accomplished using TRAC technology. “The TRAC method increases the sensitivity and specificity of drug-drug interaction screening,” said Heinnerk Boriss, Ph.D., CEO, Sovicell. The method can therefore be readily applied to biomarker discovery and validation as well as nonclinical diagnostics. In fact, gene panels for other applications, such as oncology, are readily available. Dr. Boriss said that TRAC methodology is an advance over the current standard in gene expression profiling in that it eliminates three of the four steps: cell lysis, mRNA extraction, cDNA conversion, and amplification. “Hybridization with target probes is conducted directly in the lysed cells,” thereby saving time and money, Dr. Boriss said. “It also increases the accuracy of the final result” by eliminating three steps, which introduce substantial variability in the quantification. Gene expression screening with TRAC technology eliminates costly, time-consuming, and error-prone steps in existing methods, said Dr. Boriss. “Measuring the induction of drug metabolizing enzymes with mRNA expression profiling has a 30% higher sensitivity than the traditional activity screens,” he explained. It is well known that some drugs inhibit one or more of the drug metabolizing enzymes such as cytochromes (CYP P450), which may result in decreased metabolism of other drugs, raising their levels in the body to toxic proportions. Other drugs may induce the expression of these CYP enzymes, which increases metabolic rate, effectively lowering the concentration of other drugs, thereby resulting in a loss of efficacy. It has been shown that mRNA expression profiling increases the sensitivity of CYP induction screening—measuring CYP3A4 mRNA as a marker for pregnane X receptor-activated induction of drug-metabolizing enzymes. This observation led FDA and EMA to adopt mRNA expression screening into their guidelines for drug-drug interaction studies, noted Dr. Boriss. “The sheer simplicity of the TRAC technology enables comprehensive screening for potential expression of drug-metabolizing enzymes, which in turn will contribute to safer medications,” argued Dr. Boriss. TRAC gene expression assay kit in use: Fast hybridization is achieved by coupling the probes to magnetic beads after hybridization is completed. 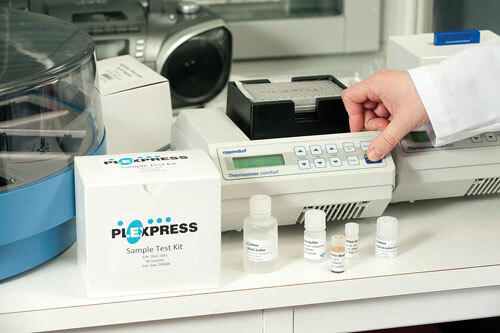 Sovicell recently signed a collaboration agreement with Plexpress in Finland to market its TRAC technology for gene expression screening.